Are there layers to listening? Folks today listen fast. We have to. We have information coming at us from all directions at rapid fire pace. Young people are unfazed by this. They’ve grown up with it and seem to have perfected the technique. Then, she looked back at me. Nearly, speechless, I asked if she’d hold my shoes while I went to look at what they had available. I had no doubt that my shoes would be waiting when I returned. This woman was astounding. And I tell her story this way, in bullet points, because I must. It’s how we read and how we hear — these days. Our lives are filled with distraction and diversion, but we manage to take it all in. Just enough of it to get the idea, because that’s all we have time for. Funny, diversion used to be such a good thing. It was something that rescued us from our monotony and lifted us to the sublime, the humorous or at least the entertaining. Now, it’s standard. Comes on the basic model. What, then, of us “contemplatives?” And I don’t mean monks or hermits or cloistered religious folk, but people who tend to cogitate and reflect by nature. Are we being shallowed, too? Perhaps, we, like the Universe, are slowly moving away from our center. Not exploded by the force of the Big Bang but drawn outward by a magnetic force. If I am always operating at the surface, what is in the deep? 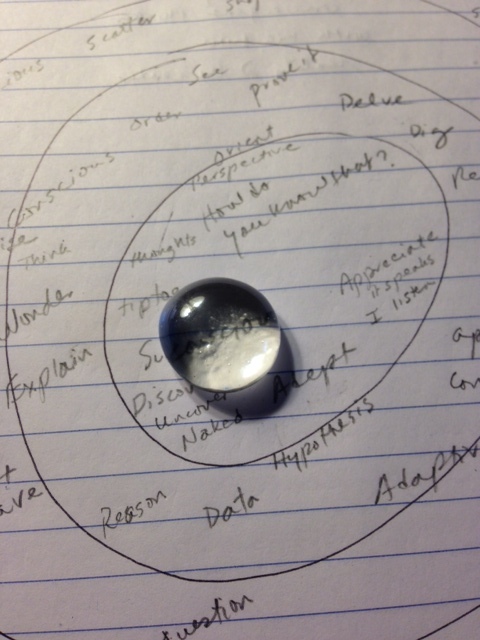 I drew 3 concentric circles in my journal and stood by to see what emerged. The surface was very easy to populate with words: shallow, listen up, easy to wake, distraction, diverge, snapshot, wander. Surprised myself with: productive and superconcious. But these words did not emerge alone. They came in 3’s, partnered with under words and yet deeper words. Underneath were: dig, delve, order, explain, reason, data, apply, converge. Surprises: wonder and hypothesis. Perhaps those are borderline to the deeper words like: discover, uncover, naked, appreciate, adept, perspective, see, tiptoe. That was the place of deep listening. How’d a kinesthetic get there? By one smooth, clear, baptismal stone. It was a gift from the folks at SOULfeast during one of their worship services. I like it because it’s surface feels right to my fingers. Somehow it clarifies my thoughts. Amazing the power of one smooth, clear stone. Up close. That’s what it said. From a distance, this small stone looked like a drop of water, beaded up from the page. How can I magnify my listening from a distance? I can’t, but God can. No matter how far I pull away, I am still in connection with the center that holds me. How do I know that? I have seen it. Even when I can’t see it, I can feel it. It spells itself out for me. Imagine that… just for me. Magnificent! Posted on November 16, 2013, in Body, Cool Science, Deeper Sensation, Mind, writing and tagged Baptism, contemplative prayer, deep listening, distraction, diversion, God, journaling, Magnifying, Shalem Institute, SOULfeast, words. Bookmark the permalink. Leave a comment.